For most people considering a cosmetic procedure, one of the biggest concerns is going under anesthesia. Here's what you need to know. For most people considering a cosmetic procedure, one of the biggest concerns is going under anesthesia and the potential risks associated with it. The good news is that modern cosmetic surgery often allows for different types of anesthesia and, while general anesthesia should not always be looked upon as a risky option, patients can be offered a choice of anesthesia and how awake they want to be during their procedure. But even if you are considering a minimally invasive procedure, you will likely be given some form of anesthesia in order to make the procedure as comfortable as possible. Anesthetics are drugs administered to reduce sensitivity to pain. There are many types of anesthetics, from topical numbing creams to drugs that are administered intravenously (through an IV). The type of anesthetic drugs used in any given procedure will largely depend on the type of surgery being performed, but the goal of anesthetic is always to keep the patient comfortable and to allow the practitioner to do their work without causing pain. Common anesthetics fall into four categories. Many types of procedures can be carried out using only local anesthesia, which targets a small area of the body. Drugs are usually administered by individual injections around the area that will be treated, so the most discomfort you will feel during the procedure will be those initial pin pricks. After that, you may experience some pressure while the medical procedure is carried out, but you should not feel any pain. Local anesthesia allows the patient to be fully awake and alert during treatment and most people have their first experience of local anesthesia at the dentist’s office when having a minor procedure. The biggest benefit of local anesthesia is a reduction in downtime. By reducing the chances of side effects, including nausea and vomiting that can be associated with other types of anesthesia, and since the patient remains fully conscious during the process, it allows those who have a procedure under local anesthetic to go home on the same day and return to their normal activities quickly. The decision to use local anesthesia will depend on a number of factors, including the nature of the procedure, your medical history, and your personal choice. Local anesthesia can sometimes be combined with sedation, especially if you are a nervous patient who could find it distressing to be fully alert during a procedure. Regional anesthesia is a form of anesthetic that numbs a specific part of the body, but a larger area than possible with local anesthetic. The most commonly known form of regional anesthesia is the type used during childbirth: the epidural. But that is not the only form of regional anesthesia and the technique can be used for procedures on the abdomen, lower limbs or even the arms. It’s a popular option for patients who have a medical history that would make a general anesthetic a higher risk. Regional anesthesia provides a viable option for patients who aren't suitable for (or don't want to have) general anesthesia to have more extensive surgery. While the drugs that provide regional anesthesia do not sedate the patient, many opt to have sedation in conjunction with nerve blocking or epidural pain relief in order to stay relaxed throughout the procedure. This type of anesthesia also provides pain relief for the immediate post-surgery period, but other drugs are commonly provided to ensure that you are as comfortable as possible during recovery. Downtime from regional anesthesia varies, but depending on the nature of the procedure patients may be able to go home on the same day. Once the drugs wear off, normal function generally returns, though regional anesthesia does come with some risks, like allergic reaction. Rarely, complications occur with epidural and spinal injections that can result in temporary or long term paralysis, but your surgeon and anesthetist should discuss all risks with you when presenting anesthesia options. Monitored sedation is used in cosmetic surgery to ensure pain management and to keep patients comfortable during surgery, but you may have also come across it during diagnostic testing. Monitored sedation, sometimes referred to as twilight sedation, is administered intravenously (by an IV) and, according to the American Society of Anesthesiologists, is used for shorter or less complex procedures or when regional anesthetic would not be effective. Minimal: minimal sedation helps patients to relax, but they generally remain awake for the procedure. The doctor will be able to ask you questions and you will be able to follow directions as needed. Moderate: patients feel drowsy during moderate sedation and may fall asleep during the procedure. You will be able to remember some or all of the procedure and will be aware of time passing. Deep: patients under deep sedation are asleep but not unconscious. You would have little or no memory of the procedure and may feel more tired than usual upon waking. A procedure under sedation must involve the presence of an anesthetist and you may have a consultation with them before your procedure. They will take into account several factors to establish which level of sedation is appropriate, including your age, general state of health, the nature of the procedure, and your medical history. General anesthesia is the best known form of anesthetic and is used for major procedures. General anesthesia is administered using either a mask or IV drip. 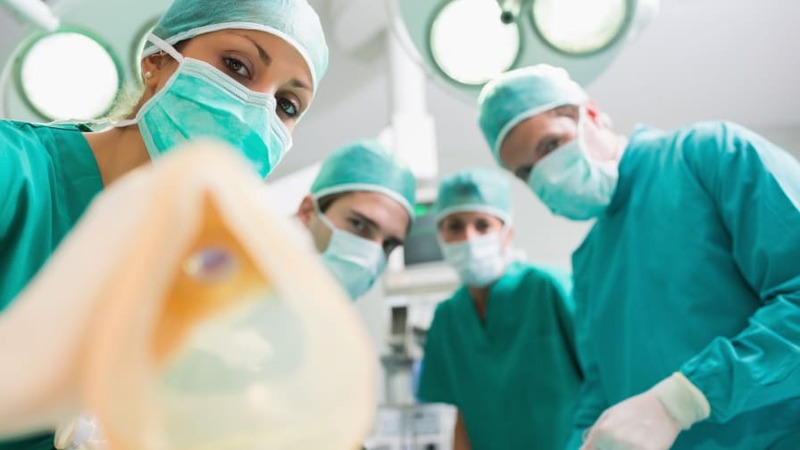 While under general anesthetic, the patient is unconscious and some of the body’s functions slow down, which makes it easier for surgeons to perform surgery. That also means that you will not feel any pain or have any memories of the procedure. During the procedure, nurses and anesthetists will monitor your vital signs, including your blood pressure, and adjust the amount of anesthesia accordingly. While you may be able to return home on the same day as having surgery under general anesthesia, you will not be allowed to drive. It is common for patients who have a procedure requiring general anesthesia to remain at the hospital or clinic overnight, so that the medical team can monitor pain and other symptoms to ensure it is safe for you to return home. Side effects are more common with general anesthesia than with other forms of sedation or anesthesia. These often include nausea, vomiting, dizziness, and, while rare, allergic reactions to the drugs used. The type of anesthesia used during a cosmetic procedure will depend on a number of factors, but primarily the nature of the procedure and your medical history. Beyond this, you may be offered a choice of options, and those who anticipate being anxious during the procedure may wish to opt for a greater level of sedation. These days, complications from all forms of anesthesia are rare, but they do remain a possibility. Your physician should always discuss any risks with you. Full details of your medical history and allergies will be taken during your pre-operative appointments to limit these risks as much as possible, but if you have any questions or concerns your medical team will be able to discuss them with you.